The ACS provides authoritative information on breast cancer prevention, early detection, treatment, side effects, symptom management and coping. NCI provides comprehensive information on cancer treatment, screening, prevention, supportive care, complementary and alternative treatments and clinical trials. This is a national organization that provides information regarding breast cancer prevention, early detection, treatment and symptom management, along with support services. Y-ME is a national organization that provides support and information regarding breast cancer to survivors and families about early detection, prevention, treatment, and symptom management. FORCE is a nonprofit organization for women with increased risk of cancer due to family history or genetic status and for members of families in which a BRCA mutation may be present. Myriad Genetics has a number of technologies that permit doctors and patients to understand the genetic basis of human disease and the role genes play in the onset, progression and treatment of disease. The NLN is an internationally recognized organization whose goals are to provide education and guidance to healthcare professionals, the public, and patients with lymphedema. LAF provides practical information and tools that people living with cancer need. The LAF mission is to inspire and empower people with cancer through education, advocacy, and public health and research programs. LGFB is a free national public service program supported by corporate donors to help women to offset appearance-related changes from cancer treatments. This site, sponsored by the Oncology Nursing Society, provides symptom management for common side effects of cancer treatment, including fatigue, hormonal issues, pain and cognitive changes. Information about Breast Specific Gamma Imaging (BSGI). Explanations for how various procedures are performed and what to expect. Five Wishes resources help you express how you want to be treated if you are seriously ill and unable to speak for yourself. It is unique among all other living will and health agent forms because it speaks to all a person's needs: medical, personal, emotional and spiritual. Five Wishes also help structure discussions with your family and physician. Beauty through Cancer focuses on helping women through the hard realities of cancer treatment and how it effects how they perceive themselves. They work with cancer patients, family, caregivers and survivors to help women with wigs, skin care and makeup. 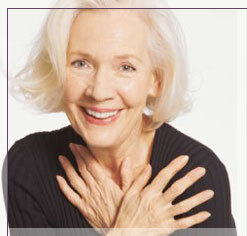 They also offer restoration and completion of breast reconstruction through areola pigmentation.